Lots of people think verbal self-defense means fighting back. Their image of verbal self-defense is a collection of killer smart cracks plus strategies for using language to wipe the floor with their opponents. It's not an accurate image. In this edition of How Stuff Works, I'd like to show you a different way to relate to other people, especially when you disagree. Let's talk about it a minute. It has undoubtedly happened to you. There you are, in the middle of a fierce argument with someone, and suddenly you realize that you not only don't particularly care about the subject of the argument but you can't understand how you got into the altercation in the first place! This isn't trivial. Hostile language is dangerous to your health and well-being; it's toxic stuff. People who are frequently exposed to hostile language get sick more often, are injured more often, take longer to recover from illness and injury, and suffer more complications during recovery. As an obvious result, they tend to die sooner than those not so exposed. What's more, hostile language is just as dangerous to the person dishing it out (and to innocent bystanders who can't leave the scene) as it is to the person on the receiving end. Obviously it's to your advantage to stay out of arguments in both your personal and your professional life, unless something truly important -- something about which you care profoundly -- is at stake. Even then, most of us are aware that it's possible to have intense discussions that don't turn into altercations. How is it, then, that intelligent people keep finding themselves involved in arguments almost by accident? The answer is pretty simple, and it's a relic of the days when humankind dealt with sabertooth tigers at close range on a regular basis. One of the parts of your brain (the amygdala) is on constant duty, and one of its primary tasks is to scan for danger. When it spots an incoming perception that meets its criteria for danger, it has the ability to send a message that provokes an immediate fight-or-flight reaction, and it can do that without first going through the reasoning part of your brain. It can literally short-circuit your thinking process. In the sabertooth tiger days this was a good thing. You saw something vaguely big and furry, and you either left the scene fast or threw your club. You acted first, and then you thought about it, which increased your odds of survival a good deal. This part of your brain can still be a good thing on those very rare occasions when you do face imminent life-threatening sudden peril from tornadoes or terrorists or mad gun-toters. The problem is that it's just as likely to kick in when the only threat you face is some klutz who wants to argue about whether his computer is more powerful than your computer. If the amygdala thinks the klutz is a threat, it bypasses your reasoning brain -- and shortly you're thinking, "I don't even CARE whether my computer has more memory than this turkey's computer! How the heck did I get INTO this?? And how the heck do I get OUT of it so I can get on with my day??" This can happen to anybody now and then; we all just lose it sometimes. But if it happens often, it's a grave threat to your well-being. It's a lot more dangerous to you than most of the risk factors you spend time and money trying to guard against. You need to know how to put an end to this nonsense. First and foremost, you need to educate your amygdala. When somebody comes at you with hostile language, your amygdala typically says, "DANGER! RED ALERT! ", and off you go. You need to be able to change the criteria your amygdala has for defining a threat. Suppose a two-year-old runs at you screaming "YOU BIG MEANY! I don't LIKE you!" and starts pounding on your knees with tiny fists. Your amygdala doesn't pay the slightest attention. You know the toddler is no threat to you, you understand what causes such episodes, and you have better sense than to get involved in a fight with the poor little kid. The key here is that you understand what's going on, and that lets you stay detached and rational. With verbal attackers, the problem is that we usually don't understand what's going on. The dominant idea about such people in our culture is that their goal in attacking you verbally is to hurt you, to cause you pain, to do you harm -- and that does of course fit your amygdala's specifications for danger. However, the idea is all wrong. It's a myth, just as "Sticks and stones will break your bones but words will never hurt you" is a myth. A small percentage are simply klutzes. They're ignorant. They know no other way to communicate with other human beings. All they need is education. As for the rest, they're desperate for attention and they know that throwing hostile language at you will get your attention. In both cases, once you understand what's really going on, your reaction to such people will no longer be, "Danger! Red alert!" Your reaction will be compassion. As in "Poor thing. Desperate to communicate, and that's the best he/she can do." Or "Poor thing. Desperate for attention, and that's the best he/she can do." You still may not like the attacker and you'll still find the attacker's behavior unacceptable, but you won't have any interest in arguing. "In order to understand what another person is saying, you must assume that it is true and try to find out what it could be true of." That is, when somebody says, "Hey! My toaster talks to me! ", your proper response is a neutral "Oh? What does your toaster say?" Followed by careful listening, with your full attention. You're not accepting as true the statement that the person's toaster talks to him or her; you're assuming temporarily that it is true, and then you're listening carefully to find out what the statement could be true of. "He's only saying that because.... he's uneducated/crazy/drunk/old/sadistic/showing off." "She's only saying that because.... she's an airhead/vicious/on drugs/totally confused/out to get me." "They're only saying that because... I'm short/people like them have no manners/I can't afford a decent suit/they don't like me." X: "Hey! My toaster talks to me!" YOU: "Look, I don't have time for that kind of garbage! I've got work to do!" X: "And I suppose MY work isn't as important as yours?" YOU: "I didn't say that." X: "Oh, yes you did!" YOU: "I did NOT! I just said..."
And so on, downhill from there. People tell me they don't have time to listen, they're too busy. I can assure you, based on three decades of teaching verbal self-defense, that they spend far more time straightening out the messes that result from not listening. Give the speaker your full attention for as long as it takes to understand what's really being said and why. Even if the speaker is a child. Perhaps especially if the speaker is a child. I once heard a mother answer a child's "Mom, I wish I was dead" with "Were dead, dear, not was dead." This is how we end up reading in newspapers that a child has done some terrrible thing "without warning." This is what's behind going home one night and finding that your spouse has left you "without warning." There's always a warning, but somebody has to be listening to it; otherwise, the person will give up and stop trying. Attacking back - "How DARE you say that to me!" Pleading - "I can't BELIEVE you're going to start that again when you KNOW how much work I have to do today!" Debating - "There are three reasons why what you say is ridiculous. First..."
All three are strategic errors, because all three reward the attacker by providing your immediate full attention, often with an emotional reaction thrown in that increases the intensity of that attention. All you do when you use those three traditional responses is encourage the attacker to do it again. After all, it worked. What you need is a response that doesn't do this. You need a response that lets the attacker know you won't serve as willing victim. Fleeing the scene won't do it; fleeing makes it obvious to attackers that they "got to you"; they'll be eager to try again. Silently ignoring attackers won't serve either; in our culture, silence is punishment, and is just another kind of counterattack. Like fleeing, it says, "You got to me. You can push my buttons." When I'm asked to teach just one quick technique that can be used in lots of situations and is easy to learn, I teach the Boring Baroque Response (BBR). Suppose you have to deal with someone who is forever coming at you with hostile attacks like "WHY can't you EVER do your share of the WORK around here??" and "WHY do you eat SO MUCH JUNK food??" and "WHY don't you stop DRESSING like a NERD??" X: "WHY do you eat SO MUCH JUNK food??" YOU: "Whadda you MEAN? I DON'T eat a lot of junk food!" X: "Oh, NO? What about that DOUGHNUT I saw you eating ten minutes ago?" YOU: "Listen, I didn't have time to eat breakfast! I NEEDED that doughtnut!" X: "Oh, yeah? Well what about that PIZZA you ordered yesterday afternoon...."
This gives your attacker a chance to run you through a long list of complaints about the way you eat, and to demonstrate his or her power to really get you going. Even if you come out of this thinking that you have "won the argument," you've lost -- because the attack worked, and the attacker got what he or she wanted. People like your attacker are like little kids who'd rather be punished than ignored: If the only way they can get your full attention is to get your negative attention, they'll settle for that. Instead of falling for this tactic, use a Boring Baroque Response. Your attacker has come at you with "WHY do you eat SO MUCH JUNK food??" And here's what you say, while you stare not at the attacker but off into space, as if you were thinking deep thoughts. When the attack comes in the form of a statement instead of a question, as in "ALL YOU DO is stuff your face with JUNK food!! ", just begin with "You know, hearing you say that reminds me of something that happened to me when I was just a little kid...." and so on. If you need a hifalutin version, say it reminds you of "an article I read only the other day in the New York Times. No, wait a minute.... It couldn't have been the New York Times. It must have been the Washington Post, because that's the one that comes on Thursday and Eileen always gets it before anyone else and....." . The BBR is also the best way to deal with none-of-their-business questions and comments from strangers. Like, "Oh, what a cute baby! It looks Chinese! [Or Spanish. Or whatever. The nosy stranger's point is that whatever the baby looks like, it doesn't look like it shares your ethnic heritage.] Where did you GET it?" Just remember one thing: You have to do the BBR straight. If you sound sarcastic or patronizing or hostile, it becomes a counterattack and it won't work. lots and lots of personal vocabulary and personal comments. lots of extra stress on words and parts of words. Responding with more of the same is like throwing gasoline on a fire; it gives your attacker everything needed to feed the argument and make it escalate. There's a very different way of talking (from the work of Virginia Satir), that I call Computer Mode. To use Computer Mode: You avoid everything personal; you talk in platitudes and generalities and hypotheticals; and you keep your body language -- including the tune your words are set to -- neutral and controlled. Computer Mode defuses verbal attacks because it doesn't give the attacker what he or she wants and it doesn't give the attacker any fuel with which to keep the altercation going. There is no safer stance. "People get irritated when they can't find things." "It's very annoying not to be able to find things." "Misplaced tools [or books, or supplies, or whatever] cause problems in every workplace [or home, or clinic, or whatever]." "Nothing is more distressing than having to hunt for things." No matter how many more times the attacker throws hostile language at you, continue to answer only with another response in Computer Mode. If the hostile strategy has always worked in the past, it may take the attacker a while to understand that it's not going to work this time. Eventually, the attacker will run out of steam and give up -- and again, will make a mental note that you're no fun as a victim and shouldn't be chosen for that role in the future. You'd be amazed at how many potential arguments I've nipped in the bud with a single meaningless emergency platitude. The attacker makes the first hostile move; and I answer, solemnly, "You know, you can't tell which way the train went by looking at the tracks." Many, many times, the next line from the poor soul attacking has been, "I never thought of it like that." Almost every time, the argument has ended right there -- for an impressive savings in time and energy all around, and far less pollution of the language environment. In every hostile-language situation you have a broad range of responses at your disposal, from fierce anger at one extreme to silence at the other. Different responses have different consequences. The consequences of either the amygdala-driven fight-or-flight response, or the traditional responses of counterattack and pleading and debate, are rarely satisfactory. The consequences of chronic exposure to hostile language literally threaten your life and the lives of everyone else one involved. You don't have to go that route. Use verbal self-defense instead. Suzette Haden Elgin, Ph.D., is an expert in applied psycholinguistics and is the founder of the Ozark Center for Language Studies (OCLS). OCLS offers a complete line of verbal self-defense products and services; for more information, contact Suzette directly. She is the author of the Gentle Art of Verbal Self-Defense series, including: How to Disagree Without Being Disagreeable, You Can't Say That To Me!, and more than a dozen other books and audio programs. 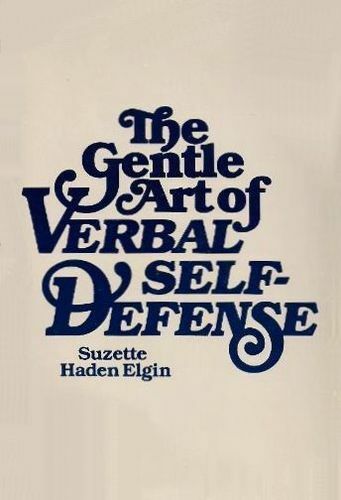 You can also find a lot of information on verbal self-defense in her recent The Grandmother Principles and in her novels, which aren't part of the series. Go to http://www.sfwa.org/members/elgin for links and details. Happy Lunar New Year/Chinese New Year 2013! Tony Blauer - No FEAR or KNOW Fear ? ?